As discussed above, the major disadvantage of a cash benefit is the added cost due to a variety of factors. The most “manageable” of these pertain to the following: managing utilization, accurate and timely benefit determination and re-assessments and monitoring and addressing potential fraud and abuse. This section summarizes the “best practices” insurers use to maintain as competitive and cost-effective cash benefit as possible, as well as to ensure that benefits are provided equitably and appropriately. While the CLASS Act will be offered without underwriting, most of the insurers offering a cash product underwrite to varying degrees. All insurers in the individual market employ underwriting. If an insured is requesting a high daily/monthly benefit amount and/or a large lifetime maximum where a cash benefit component is included, the insurer will generally take in to account the risk posed by that applicant relative to the coverage they are seeking. Some insurers make a “counter offer” of reduced coverage than what was applied for rather than declining an applicant or issuing them coverage on a sub-standard (higher premium) basis. On the group side, one carrier offering an all cash option does not offer guaranteed issue. However, they use both case-level and individual underwriting although a shortform may be used in this market. Another insurer with an “all cash” benefit offers coverage on a guaranteed issue basis but does case level underwriting, limits the benefit amounts and durations, and sets either minimum participation levels and/or requires an employer contribution which significantly enhances participation. In earlier policy forms with its cash benefit, this insurer offered coverage on a guaranteed issue basis but had a policy provision which indicated that benefits would be triggered by a loss of 2 additional ADLs to whatever the applicant had at time of enrollment; the result of this is that if someone was already impaired in 2 ADLs at the time of enrollment, benefits would not begin until they reached a 4 ADL level of loss. While we would not, for many reasons, consider this a “best practice,” it was being used at one point in time to manage the risk of not using underwriting with an “all cash” product. Another carrier offers a cash benefit rider in the group market without underwriting however, as is typically the case with guaranteed issue, it is limited to a defined enrollment period and a meaningful “actively at work” definition. Also, the maximum daily benefit offered on a guaranteed issue basis is under $350/day. Anything over that (coverage goes up to $500/day in this case) must be underwritten. While it is rare, one carrier that does offer a lifetime benefit in the group market with a cash rider would only do so with full underwriting. While some insurers offer lifetime coverage, most do not allow a policy to be issued with both lifetime coverage and a cash benefit option. This is more true for those offering a cash benefit rider or an all cash benefit than for those carriers which have “ancillary cash” or a built-in cash provision. Those two approaches are another alternative strategy for using benefit design to manage the risk of the cash benefit. Insurers also impose limits on the amount of daily or monthly benefit available with a cash benefit. Some do so within a cash rider by allowing a benefit amount less than the full amount that can be sold on an indemnity or reimbursement basis (e.g., a $350/day maximum on the cash rider but a $500 maximum on the reimbursement benefit). With respect to the “built-in” cash benefit, several insurers indicated that the “built-in” cash benefit was designed to be “premium neutral,” which is why it pays at a lower rate (10% to 50%) than when benefits are elected on an expense reimbursement basis. Additionally, most insurers offering a monthly benefit -- whether cash or reimbursement -- do so on a pro-rated basis.The amount of monthly benefit available to the claimant is equal to the percentage of days of the month on which they satisfied the benefit eligibility criteria. For example, someone who becomes disabled on June 1st and remains disabled the entire month would receive their entire monthly benefit amount (whether cash or reimbursement) but someone becoming disabled on June 15th would receive only half of their monthly benefit allowance. A few insurers impose an “inner limit” on the amount of benefits that can be paid with cash. So someone with a lifetime policy maximum of $150,000 might only be allowed to receive 10 x the monthly maximum or $60,000 in the case of a $6,000/month benefit amount. When a smaller lifetime limit is imposed, it might be offered as an “ancillary” benefit and may or may not draw down on the lifetime maximum although it is unusual to have any benefit payment fall “outside” the lifetime policy maximum -- whether it is a cash benefit or not. Appropriate and timely benefit assessments and re-assessments were cited universally by those administering cash benefits as one of the most important risk management tools. The additional challenge of administering a cash benefit policy is that it is more difficult to determine benefit eligibility (i.e., the nature and degree of functional or cognitive loss) without records of expenses incurred, services provided or other medical or care notes. Therefore, an in-person assessment is typically required either more frequently or all the time (it differs by carrier practice) in the case of a cash benefit where it is used less frequently in a reimbursement benefit when other information is available and adequate to substantiate the loss. Similarly, given the not insignificant (30 to 40%) recovery rate in long term care, it is very important to do timely re-assessments. One study found that 70% of claimants had at least one “transition” in terms of nature and degree of disability over the course of their disability. At a minimum, some carriers mentioned conducting re-assessments every 90 days. Receipt of a cash benefit is a powerful incentive for an insured or their family to maintain the receipt of benefits when the insured may no longer be benefit eligible; this is especially true if the cash benefit is being used for basic living expenses and not for the provision of paid care which of course would no longer be needed upon recovery. One carrier said that the need to do more frequent on-site assessments with a cash policy likely resultsin assessments costs which are two or four times as much as they would be under a reimbursement policy. Some of the tools carriers use to assist in gathering needed information for benefit reassessment include structures questionnaires to physicians about the claimant’s need for supervision and support, ADL questionnaires for providers and informal caregivers, medical management tools, and the like. Telephone-based assessments can be helpful but only when there is other corroborating information like care notes or provider records. A tax-qualified LTC policy must provide benefits in accordance with an approved Plan of Care developed by a Licensed Health Care Practitioner. While all TQ policies do this, the interpretation of what constitutes a Plan of Care and how it can be used varies widely. Some insurers see the Plan of Care merely as an articulation and description of the nature and degree of loss such that the insured is benefit eligibility and do not go further to specify recommended or prescribed service types or frequencies. Other Plans of Care do go into further detail about care options and service settings, including both those covered under the plan as well as other community or free resources that might be available to the insured to help support their care needs. Some insurers monitor that benefits are provided in accordance with the Plan of Care by reviewing expenses submitted under a reimbursement policy. In a cash policy, the insurer interested in maintaining care consistent with the Plan of Care must rely upon care notes provided by either formal or informal caregivers. Some companies provide a format and guidelines by which families can document care notes while others do not. One unique approach by a company that offers an “ancillary cash” benefit is to use the Plan of Care to define the type, amount and allowable expenses associated with the amount of the unused monthly benefit maximum which can be spent on long term care that isn’t covered in the policy -- be it family care, equipment and devices or other items. They consider this a “cash and counseling” type model. It is also important to note that the Plan of Care is never a “hard and fast” document – it changes as insureds’ care needs and their options for receiving care change. If family care is initially available, a Plan of Care may reflect that in its recommendations; if that situation changes (e.g., a family helper becomes ill or moves), then the Plan of Care is modified to identify an alternative appropriate option for care. In creating the Plan of Care, some insurers take care to assess the adequacy and competency of informal supports and unlicensed caregivers to provide care. This is an important factor whether those individuals provid care as a supplement to a reimbursement policy or as the primary source of care within a cash benefit plan. One carrier identified instances where the insured’s desired plan of care was to rely upon a spouse who was disabled to the point of being unable to provide the care needed. 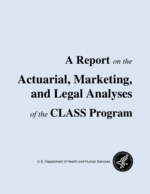 Based on the claimant study mentioned above, for about one-third of all claimants, there is a recommendation for some type of change to the plan of care as indicated by the insured’s needs and personal situation. This figure remains fairly constant over time underscoring the need for on-going monitoring of care needs to help insuredsget the most value of their coverage. And over 90% of claimants at all points in their disability cited that care management was helpful to them. A focused and active fraud investigative unit is universally cited as an integral component critical to a cash benefit plan. While fraud investigation is also important for any policy, there is a significantly heightened potential/incentive for fraud with a cash benefit. Most insurers have a dedicated fraud unit, they might use a vendor for the service and it typically involves hiring private investigators. Insurers tend to focus on situations where an insured has an especially high daily benefit amount and where the initial assessment and subsequent reassessments suggest a high likelihood of recovery. One carrier indicated that they are successful in documenting fraud in about 50% of the suspected cases. One carrier mentioned that fraud investigations typically costs about $2,000 to $4,000 per case, sometimes higher. Carriers indicated that fraud is also a more significant concern with a younger claimant population, which has obvious implications for CLASS. One insurer suggested that the fraud rates found in LTD might be a good proxy for estimating anticipated fraud in a cash-based benefit, in part because both are focusing on a younger, at work population. With older populations, the concern focuses more on fraud against the claimant and not by the claimant. Some carriers said that in general there is more evidence of fraud perpetrated by the family of the claimant than by the claimant themselves. As with all LTCI, experience monitoring against pricing assumptions is critical. Insurers say it is very important to know the actuarial assumptions with regard to utilization and recovery and to evaluate actual practice against that.